Design firm Yabu Pushelberg has created camping-style furniture to save space in the guest rooms of this hotel near New York’s Times Square. Yabu Pushelberg designed all 612 bedrooms at The Moxy Times Square – a subsidiary of hospitality company Marriott that aims to be affordable without compromising style, pitted as a “boutique-hotel concept for the modern traveller”. The hotel opened last year in a renovated property in Midtown Manhattan, which was built in 1907 to offer cheap accommodation to working class travellers. Architectural design firm Stonehill Taylor was responsible for reconfiguring the layout. 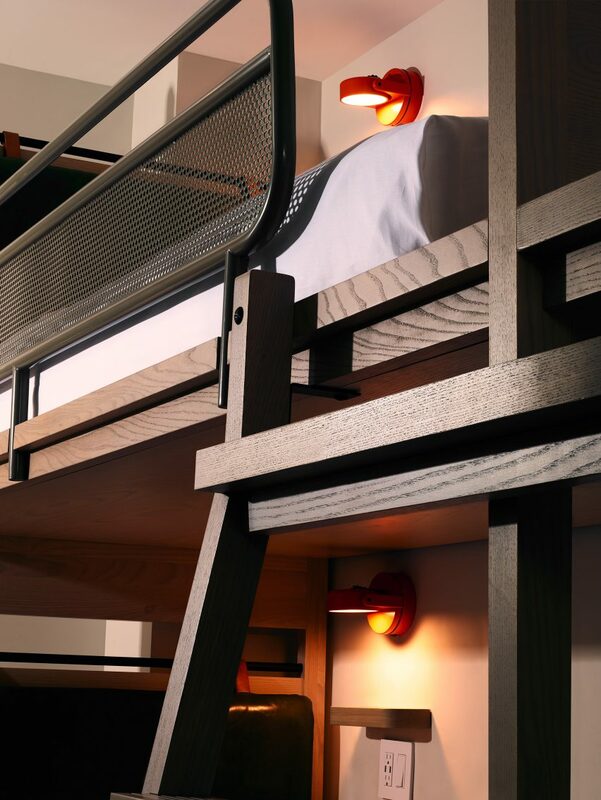 The Moxy’s guest rooms range from 150 to 350 square feet (14 to 28 square metres). Most provide for more than two occupants, including queen beds that are butted end-to-end or twin bunkbeds for four people. Yabu Pushelberg created a host of adaptable furnishings to make the most of the limited space, including chairs and tables designed to foldaway and hang from wooden wall pegs. Guests can also store belongings on these hooks, which feature custom-made clothing hangers, while additional storage is built into the bed frames. “The hotel’s concept was built on the Moxy brand’s design-forward sensibility, and is playfully executed with thoughtful detailing, honest materials, and basic exposed construction techniques,” said The Moxy. The bedrooms remain light due to white-painted walls, pale wooden siding and white bed linen. There are also a number of retro features, including a vintage chorded telephone and a self-standing hand basin. Black and white tiles line the bathrooms. In the rain showers, the tiling is used to print heights that resemble guides found in public swimming baths. Developed by Lightstone, The Moxy is among a host of new hotels that are responding to the changing habits of travellers, prompted by companies like Airbnb that offer affordable ways to explore cities. Others in New York include the recently opened Public hotel, which features a similar selection of stripped-back guest rooms, and the Arlo Hudson Square, which aims to attract “urban explorers”. The Moxy’s lobby, which was also designed by Yabu Pushelberg, contains kiosks for guest to check in rather than receptionists at desk. Guests can also log their arrival on the hotel app beforehand. An abundance of communal space rectifies limited space in bedrooms, including a series of seating areas suited to co-working and meetings. Divided by sliding glass shutters with dark wooden frames, the rooms are furnished with a mix of tables and sofas in dark green hues. Exposed brickwork walls are painted white to complement the pale wooden boards that line other spaces, where ceilings are exposed to reveal fixtures. The hotel’s Bar Moxy is located within a three-storey skylit atrium and features a copper-clad bar, a lounge and a DJ booth for parties. Accompanying Yabu Pushelberg’s interiors, New York studio Rockwell Groupdesigned the hotel’s three restaurants, which are also open to the public. The eateries include a 185-seat seafood brasserie, an all-day brunch spot, and a rooftop bar and lounge designed to be used all-year-round. All are run by Tao Group. Yabu Pushelberg was founded by George Yabu and Glenn Pushelberg in Toronto in 1980, and later established a second studio in New York. It has become the go-to for hotel brands across the world, completing other projects for the Marriott, Four Seasons and Park Hyatt. In an exclusive interview with Dezeen this year, the duo discussed how they wanted to help their home city Toronto on its way to becoming an important creative hub. Photography is by Leandro Farina.